Synopsis: Trying new things can be scary! Layla wants to go to singing club. But what will happen if she doesn’t know any of the songs? Will the other kids laugh at her? Join Layla as she decides what to do. Will she go to singing club? Will she choose to be brave? A story about a girl who is shy but does Layla overcome her shyness to join in a club of something she loves to do? Her mother wants her to join cause both of Layla’s friends are taking part and Layla’s mother knows her daughter loves singing cause all Layla does is sing and hum from the moment she wakes up till the time she goes to bed but she doesn’t sing in school and Layla enjoys singing and school. About the author: Bron Whitley is the author of the imaginative and fun Layla Down Under series of early reader chapter books for 6-8 year olds. 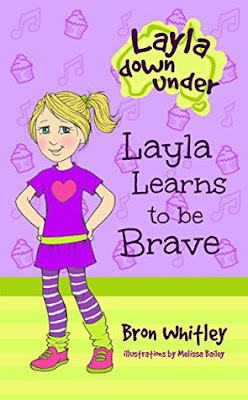 The first book in the series, Layla Learns to be Brave was released in August 2015. Bron's goal is to write fun, wholesome and uplifting books for kids of all ages.Bron Whitley lives in Brisbane, Australia. She has three small children who keep her constantly on her toes, an old faithful dog, and a husband with a guitar collecting problem. Bron Whitley has always loved to write, and the story lines in her children's books are often inspired by her own children's antics. Review: This book is really good and easy to get in to and it’s hard to put down once you pick it up. It did not take me long to read it is a short story but it is really nice story about Layla overcoming her shyness and join a club to do what she loves and Layla is a really good big sisters to her brother and sister this book is part of a set and l cannot wait to read more of this series.